Nature provides copious examples of self-assembling supramolecular nanofibers. Among them, amyloid structures have found amazing applications as advanced materials in fields such as biomedicine and nanotechnology. Prions are a singular subset of proteins able to switch between a soluble conformation and an amyloid state. The ability to transit between these two conformations is encoded in the so-called prion domains (PrDs), which are long and disordered regions of low complexity, enriched in polar and uncharged amino acids such as Gln, Asn, Tyr, Ser, and Gly. The polar nature of PrDs results in slow amyloid formation, which allows kinetic control of fiber assembly. This approach has been exploited for fabrication of multifunctional materials because in contrast to most amyloids, PrDs lack hydrophobic stretches that can nucleate their aggregation, their assembly depends on the establishment of a large number of weak interactions along the complete domain. The length and low complexity of PrDs make their chemical synthesis for applied purposed hardly affordable. 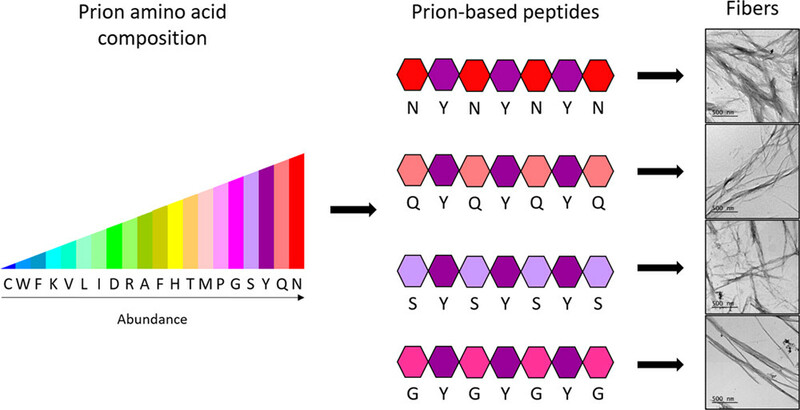 Here, we designed four minimalist polar binary patterned peptides inspired in PrDs, which include the [Q/N/G/S]-Y-[Q/N/G/S] motif frequently observed in these domains: NYNYNYN, QYQYQYQ, SYSYSYS, and GYGYGYG. Despite their small size, they all recapitulate the properties of full-length PrDs, self-assembling into nontoxic amyloids under physiological conditions. Thus, they constitute small building blocks for the construction of tailored prion-inspired nanostructures. We exploited Tyr residues in these peptides to generate highly stable dityrosine cross-linked assemblies for the immobilization of metal nanoparticles in the fibrils surface and to develop an electrocatalytic amyloid scaffold. Moreover, we show that the shorter and more polar NYNNYN, QYQQYQ, and SYSSYS hexapeptides also self-assemble into amyloid-like structures, consistent with the presence of these tandem motifs in human prion-like proteins.